Lola Nolan is eccentric to say the least. Rather than dressing in the hippest fashions, she chooses instead to live her life in costume and the more outrageous the better. To an outside observer, one might initially assume this is her form of rebellion, but in actuality, she gets along quite well with her parents and is a hard-working student. On the surface, her life looks content and peaceful, but that contentment is soon encroached upon when the Bell twins, Calliope and Cricket, move back into the neighborhood, causing her to relive some painful memories from the past. Now that Cricket, the boy she once loved, is back, Lola must face some nagging and unsettling feelings, and question the status of her relationship with her current boyfriend, Max. Along with her boy troubles, Lola also must explore some messy family dynamics when the birth mother who abandoned her when she was a baby continues to wreak havoc on their lives. Lola and the Boy Next Door also boasts an added bonus of some very familiar secondary characters: Anna and St. Clair from Perkins' first novel Anna and the French Kiss. Because they are minor characters, it is not necessary to have read Anna prior to reading Lola. My advice, however, would be to read Anna and the French Kiss first because I don't think that Lola and the Boy Next Door even remotely holds a candle to the brilliance of Anna. (Though, in perusing my Goodreads friends list, I appear to be the only one who feels this way.) 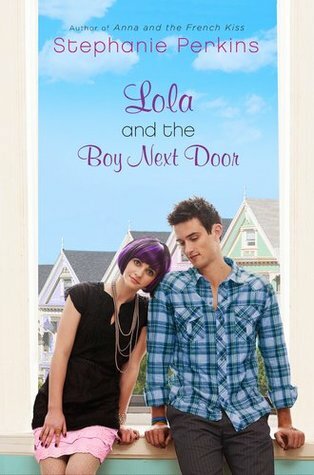 In fact, if I had read Lola first, I'm not entirely sure I'd want to read another Stephanie Perkins novel. It pains me to say that because I LOVE Stephanie So. Much. She is the first author I ever followed before her novel came out and it was so exciting to see her go from soon-to-be author to real-life, published author. But here's the thing: Anna was a book we all knew (in the book blogosphere anyway) took many years for Perkins to write. And it felt that way. As I read, I could feel her heart and soul poured out onto the pages of that book. The characters, conflicts, and descriptions felt original and authentic. But Lola? Lola felt rushed and hurried. Like it was a novel written on a deadline. For example: at the beginning of the novel, I really liked Max. I thought he was going to be a character that I would root for and make it hard for me to decide whether I wanted Lola to be with Max or Cricket. He seemed really sweet and I thought for sure when Perkins gave him a line like, "No. You're delightfully screwy, and I wouldn't have you any other way," in response to Lola's question, "You don't think I'm perfect?" that he was going to be a good guy. But he suddenly went from good guy to complete tool in a matter of a few pages. He went from being someone I thought would be a complex, three-dimensional character whom I would root for, to being a one-dimensional character created for the sole purpose of despising. Another thing that left me scratching my head was Lola's choice to dress in costume. When the reader first finds out that Lola's birth mother is the sister of one of her adoptive fathers, it seems as though Lola has chosen this form of expression as a way to get her mother to love her: e.g. "If I'm not enough for you, maybe if I become someone else you will love me." But by the end of the novel, the reader is given mixed messages about this idea. It is suggested very heavily at the beginning of the novel that her choice to dress in costume is a way to mask her feelings of inadequacy, but by the end, that idea is not so much disregarded as not explored as much as I was hoping. Something I will compliment Perkins on is that she is one of the few novelists who writes about figure skating like she actually knows the sport, using the correct vernacular and knowing all of the names and times of year for certain competitions. As someone who has followed figure skating closely for many years, I can't tell you how many authors cop out and say something like "triple jump" instead of giving the correct name of the jump the skater is performing (e.g. lutz, loop, axel, salchow, toe-loop, flip). Perkins, however, used very specific skating terminology which tells me she's either a fangirl like me or she did her research. Despite the fact that I didn't love this novel as much as I was hoping, I still have mad love for Stephanie Perkins and will continue to read all of the books she publishes. I'm just disappointed that while Anna and the French Kiss felt like a complex, layered novel that lacked the cliches and triteness of typical romance fare, Lola and the Boy Next Door had more fluff to it, presumably due to the fact that Perkins didn't have as much time to write this one as her first novel (though that is mere conjecture on my part). I don't like to be critical of one of my favorite author's works, but I also don't want to be one of those bloggers that only writes glowing reviews that feel forced and phony. To me, I'm more likely to pick up a book after reading a highly critical yet substantive review than a review full of excessive praise and empty adjectives. Ah yes, I agree completely with this review. I never felt the spark and love with Lola as I did with Anna, and I was actually pretty disappointed (though of course, Lola is still an enjoyable book). I know what you mean by Max originally seeming to be a complex character just ending up being a tool a few pages later. Great review Beth! I absolutely agree with this review! It was such a bummer reading this book because I actually didn't even high expectations for it but even that fell flat. I've been meaning to re-read it though because it seems like EVERYONE loves this book. I agree with Max! I thought he would be a complex character but it was all thrown away a few chapters later. I also will probably never get over Cricket Bell's name. Cricket Bell!!! I really hope her next novel is better because like you, I really do like Stephanie a whole lot! Thanks so much for your kind words ladies. I agonized over this review because I didn't want to say anything bad about Stephanie's book, but I'm glad there are people who agree with me. Hmmm.. To be honest, while I enjoyed ANNA, it didn't quite live up to the expectations the book blog reviews had me holding it too. It's interesting, this book seems like it may be a better fit for me than ANNA. I only have a copy of this one so I'll probably read it first. Although I admit, I'm a little hesitant after reading your review and a few of the comments.